This is a detailed, 3.25" long Diplomystus dentatus collected from the Green River Formation. It's nicely detailed with and the dark brown color contrasts well against the rock. 50 million years ago, in the Eocene (55.8 mya to 33.8 mya), D. dentatus thrived in lakes fed by Uinta and Rocky Mt. highlands. A voracious predator and delicious prey, D. dentatus is uniquely entombed in the fine-grained, lime mud of Fossil Lake. 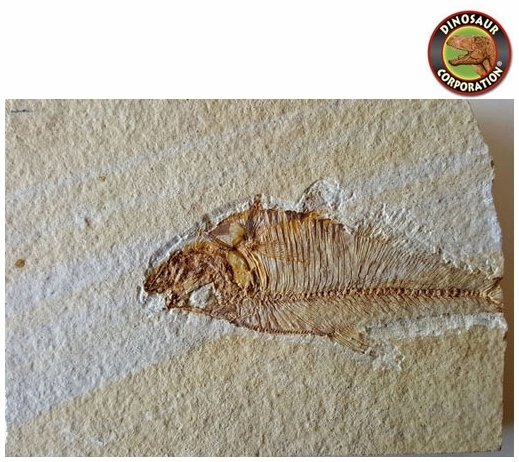 Today the wonderfully preserved fossils of Diplomystus and other Fossil Lake fauna are collected in several private quarries around Kemmerer, Wyoming. The best preserved fish fossils come from the coveted 18 inch layer. This layer is collected at night under high-powered lights allowing the faint signs of fish under the surface to be more easily observed. These �ghosted� fish then must go through many hours of manual preparation to remove the overlying rock and reveal the Green River fauna in all of it�s glory.